In many ways Dr. Amar Bose deserves as much credit for revolutionizing audio as Steve Jobs received for revolutionizing numerous industries from movies to smartphones. Bose was one of the first to take high-end audio mainstream – you could find the company’s gear at virtually every audio store in the 1980s when most other stereo equipment was more segmented between high-end and lower quality. My first encounter with the company was before 1980 where I saw an ad for the company’s direct-reflecting 901 speakers. I was a kid but I decided at the time that I needed to buy these speakers. Much of the motivation for working at the time (I worked for my father here at this very same company TMC) was to be able to afford a stereo system with these speakers. Once I earned enough money to buy them I went to Crazy Eddie (thanks dad for driving me in a snow storm and only reminding me about the incident for a few years ) to buy my speakers for $650. I’ve had numerous other Bose products throughout the years and have always marveled at how the company was able to take advantage of acoustic resonance to build a better speaker. The speakers required an active equalizer but by doing so eliminated the need for a crossover allowing the speakers to accept a great deal of amplifier power without blowing. I went into a bit of depth some years back about Bose technology when I wrote about a company named Vanu founded by Amar’s son. You’ll read about the numerous patents Dr. Bose developed and all the research the company conducted but from my perspective Bose marketing was also revolutionary. They took advertising for audio and headphones to an unprecedented level. They had fixed prices for their products which helped maintain the company’s reputation for quality. They had some of the first single-manufacturer audio retail stores. Bose brought high-end audio to automobiles – I remember what a single speaker sound system was like in a 1980 Mercury Montego… The auto industry really needed Bose and so did customers. Bose also revolutionized portable music with the Acoustic Wave system which was a high-end boom box which filled an auditorium with sound and could be carried comfortably with a shoulder strap. Then there are noise-cancelling headphones – an entire market segment the company popularized and dominated for years. 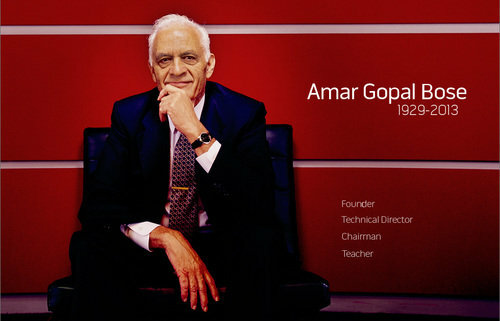 Amar Bose just died. I am truly saddened by the news. The man really changed the music industry in countless ways and should get a lot of credit for thinking differently about audio systems, marketing, business and making great products which benefitted consumers and the workers at Bose. The world will be worse-off for his loss. Bob Maresca, President of Bose also shares his thoughts on this sad news.